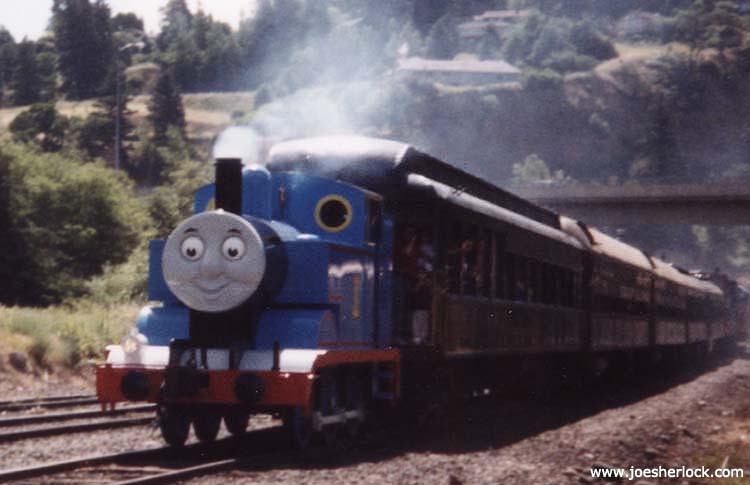 Here comes Thomas - steaming down the track. Connor and his grandfather head toward Thomas for a closer look. Connor and Thomas; Connor meets Sir Toppem Hat. 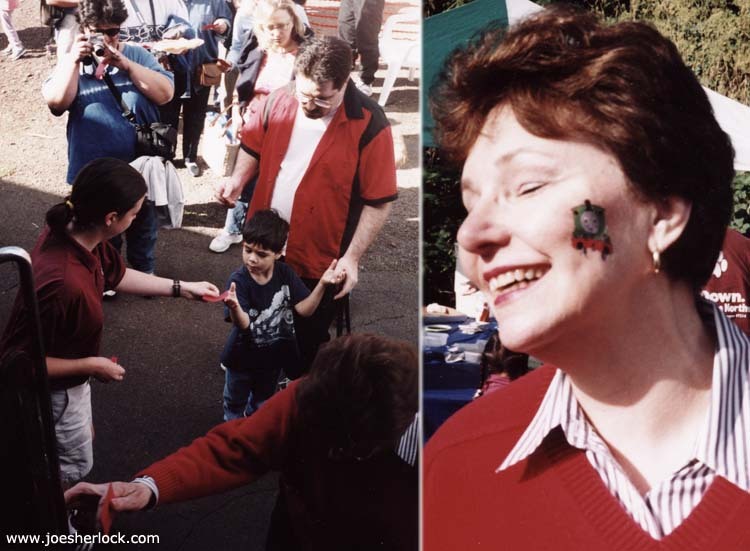 Tickets, please; Carol gets a Thomas face painting. 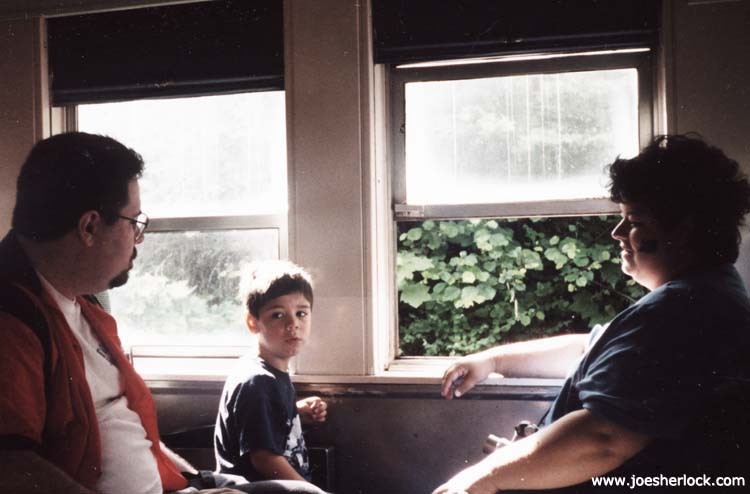 Connor and his mom and dad ride the train. Thomas The Tank Engine travels from railroad to railroad on a low-boy flatbed trailer. Thomas is well-made of heavy gauge sheet metal with cast drivers in an yard switcher-type 0-6-0 wheel arrangement (no pilot wheels, six driver wheels and no trailing wheels) and is nicely painted and detailed. But Thomas is not an operational locomotive. It is merely steam-puffing, rolling stock attached to the head end of the train which, on the Mount Hood Railroad, was pushed by a regular Mt. Hood diesel at the rear of the consist. The effect is realistic, between the steam and Thomas' high-pitched English whistle (powered by the same compressed air which actuates the brakes) it looks, at first glance, like Thomas is doing all the work. 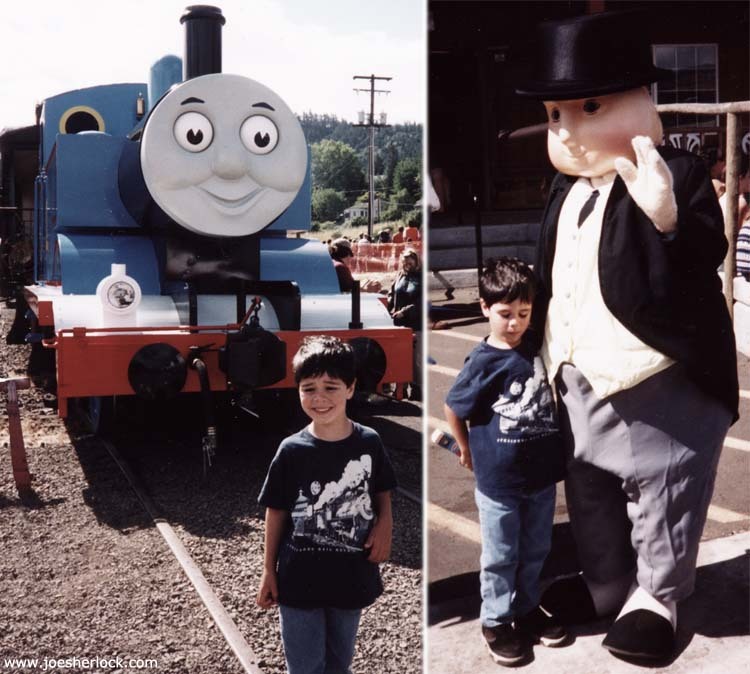 There are currently four Thomases touring North America - two are for regular gauge lines, two for narrow gauge lines. 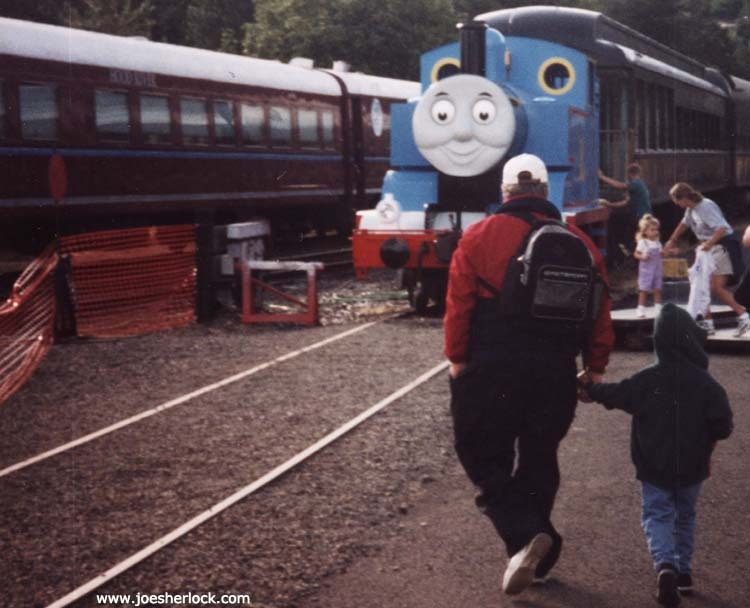 Each Thomas is available for a two-week engagement at any tourist railroad. Thomas travels from railroad to railroad on a lowboy flatbed truck. Our tickets were $14 apiece for a 30 minute quickie ride with Thomas - this price included all ancillary events - clowns, gift shops, displays, meeting Sir Toppem Hat, etc. at the Mt. Hood Railroad in Hood River, Oregon. It was a hot day when we went - but Thomas was unfazed and smiled through it all. The only overheating danger was for the poor soul in the foam rubber Sir Toppem Hat costume and for the cash registers in the gift shop. Licensed Thomas The Tank Engine merchandise of all kinds - even toothbrushes - went flying off the shelves and out the door. Additional information about Thomas can be found here.